Travis Mason, a customer of Argyle Feed and Hardware Store is our July customer of the month. 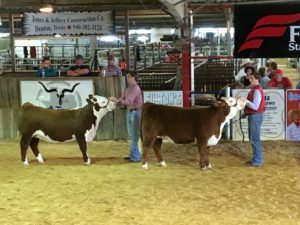 Travis Mason has been breeding and raising primarily poll and horn Herefords crossed with Red Brangus for more than 10 years. 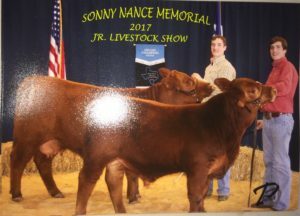 He, along with his three sons, Wyatt, Isaac, and Jesse show cattle all year long. Currently, the boys are working towards the Junior Nationals which take place in a couple weeks. 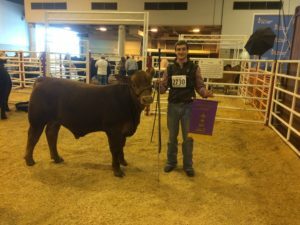 Not only does Travis raise cattle, but he likes to be involved in the community by being a volunteer firefighter for the Justin fire station. 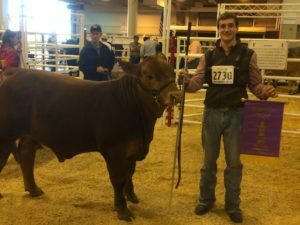 You could say raising and breeding cattle is Travis’s family business but firefighting is his passion which is why volunteering is so important to him. Experience the difference at Argyle Feed Store. Best of luck to the Mason boys! This entry was posted on Thursday, June 22nd, 2017 at 12:10 am	and is filed under News & Updates. You can follow any responses to this entry through the RSS 2.0 feed. Both comments and pings are currently closed.